The Master of Arts (M.A.) degree program in music has emphases in composition, musicology/ethnomusicology, or performance practice, and integrates studies in performance, composition/analysis, and research. The program seeks to maintain a balance of skills and interests and to encourage a diversity of approaches among its graduate students. In consultation with a faculty adviser, the student pursues a two-year course of studies culminating in a final project that combines an original composition, written thesis, or essay with a related public performance or lecture recital. The student’s role in the performance may range from that of a performer or conductor to that of a coach (of original compositions or a selected repertoire). The curriculum includes courses in research methods, analysis, composition, and performance practices in Western music from the Renaissance to the 21st century and in the musics of India, Latin America, and Asia. Graduate students have completed diverse final projects: theses in non-Western performance practice include “Continuity and Change in the Learning of Balinese Gender Wayang” and “Classification and Analysis of Rhythm and Harmony in Flamenco Guitar”; theses in Western performance practice include “Early Scottish Keyboard Music: William Kinloch. A Critical Edition” and “Piano Jewels of Alberto Ginastera: Performance Practice through Analysis in ‘Danzas argentinas’ and “‘Twelve American Preludes’ ”; theses in composition include “Cantigas Das Folhas” (composition) and “Atom Turning in the Sun of Eternity” (composition). The faculty consists of 15 regular research professors active in scholarship and performance, 5 adjunct faculty, and 19 performing artists who provide individual instruction in applied music. Working with faculty in small seminars, independent studies, and performance-thesis preparations, students develop multiple skills and competence in several musical traditions while mastering materials in their areas of specialization. Graduates of the M.A. program have become successful candidates for doctoral programs, academic positions, and other technical and professional careers in music. 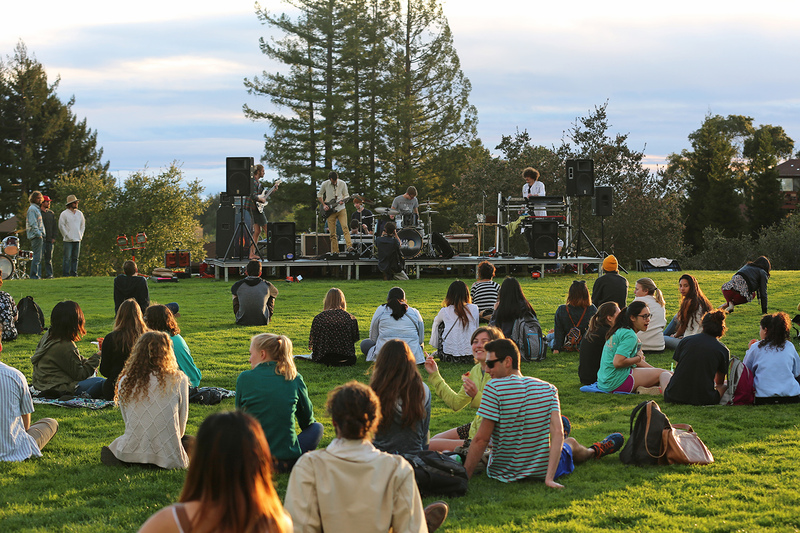 A minimum of 60 course credits completed at UCSC is required for the degree. · Music 252, Current Issues Colloquium during each quarter in residence (for students entering the program fall 2007 and thereafter). · One course in the Music 203 Performance Practice series. · Three courses from the Music 203 Performance Practice series (Music 206D, Music Perception and Cognition meets the requirement for one 203 course). It is possible in some cases to substitute a course from the Music 253 or 254 series for one 203 course. Additional course information is available at the website http://reg.ucsc.edu/catalog/. In consultation with an assigned adviser, a student selects additional courses in support of professional goals, which may include contextual studies in other disciplines (e.g., anthropology, history of consciousness, theater arts, art, art history, digital arts and new media, film and video, etc. ), language and literature studies, applied music instruction, ensembles, directed readings, or independent research. Current reading skill and comprehension of a relevant foreign language must be demonstrated upon enrollment by passing level 3 of a UCSC language placement examination, or by satisfactory completion of level 3 of the language at UCSC during the first year of enrollment. With the approval of the primary adviser, students whose emphasis is algorithmic composition may complete three quarters (one year) of university-level instruction in computer programming in lieu of fulfillment of the foreign language requirement. Knowledge of languages not offered at UCSC must be demonstrated by means to be determined by the Music Graduate Committee. Given the global nature of performance practice studies and level of language skills needed for many fieldwork and research topics, all students are encouraged to continue language studies in conjunction with their graduate program curriculum. By the end of spring quarter of their first year, all graduate students are required to submit a written proposal for their recital and thesis, prepared in consultation with their thesis adviser(s). The final requirement for the degree is an essay (for performance practice emphasis students) or a thesis consisting either of a composition or a scholarly research work, along with a related public performance. Candidates for the MA degree normally complete their graduate recital (Music 298) and thesis (Music 299) during the final quarter of enrollment. Students are required to complete 60 quarter credits of study (equivalent to 12 full-credit courses). Additional information is available by contacting Lisa Beebe, Music Graduate Advisor, at (831) 459-3199 or <mga.mus@ucsc.edu>.